WICHITA, Kan. – If you think you can’t afford a family vacation this summer, think again. 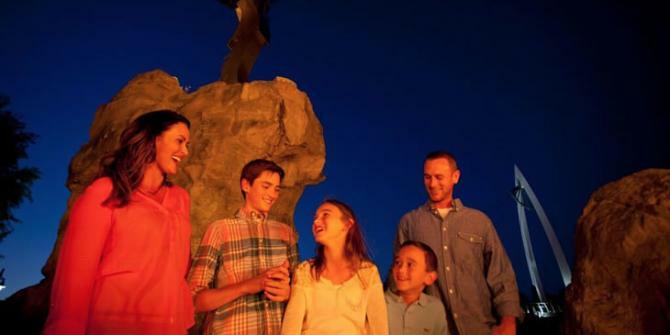 Wichita offers vacationers a plethora of affordable dining options and attractions for kids of all ages. But starting making plans today, kids will be donning backpacks and heading back to school before you know it. You’ll find culture, entertainment, dining for all ages and all-American hospitality in Wichita. There are more than 1,000 restaurants, 36 museums, 28 art galleries, 22 attractions and 17 festivals to choose from. “Wichita is the only place in the world you can feed a rhinoceros by hand and see one of the largest collections of American art – all on a budget,” said Santo. “Taking advantage of Wichita’s budget-friendly and family-friendly options can mean the opportunity to go on a vacation for many families,” Santo said. “And there are all kinds of hidden gems here in Wichita," said Santo. What are you waiting for? Get out your calendar and set a date for your next vacation. A full list of the city’s attractions, events, restaurants and hotels can be found on the bureau’s website, visitwichita.com, or on the Visit Wichita app, which launched earlier this year. Feed a lemur or rare black rhinoceros at Tanganyika Wildlife Park. See the newly unveiled Elephants of the Zambezi River Valley, the third largest elephant exhibit in the country, at Sedgwick County Zoo. Experience a simpler time at Wichita’s Old Cowtown Museum and experience Wichita like it’s 1865. Head to Wichita’s Old Town District and enjoy the warming weather and take a stroll down the area’s charming, historic brick streets. Then grab a bite at one of the many delicious eateries: pizza at Pumphouse, sushi at Wasabi, healthy sandwiches and salads from Lotus Leaf Cafe, Korean fare from GangNam Grill & Bar or street-style tacos from District Taqueria. Incredible hiking trails and adventures are all around Wichita. Get back in touch with nature at Wichita’s more than 125 parks and greenways covering nearly 5,000 acres. In addition to hiking trails, Wichita has over 26 miles of bicycle paths following scenic areas such as the banks of the Arkansas River, giving the cyclist a safe, easy and enjoyable ride. Find details at www.kansascyclist.com/trails/WichitaBicyclePaths.html. Rock climbing is available at Bliss Climbing and Fitness, Wichita’s full-service indoor rock climbing gym that features a 38 ft. top-rope and lead climbing wall, auto-belays and 15 ft. bouldering wall. Enjoy one of the only movie theaters in the country where you can enjoy a movie and be served dinner and cocktail at the Warren Theater Old Town. Dinosaurs in Motion at Exploration Place brings 14 magnificent, fully interactive, recycled metal dinosaur sculptures with exposed mechanics, inspired by actual fossils, to Wichita. The exhibit opened Memorial Day weekend and continues through September 5. The 82nd annual National Baseball Congress (NBC) Tournament will take place late this summer. The NBC World Series has been the Summer Collegiate National Championship since 1935 and features teams from across the country and more than 60 games at Lawrence-Dumont Stadium. It’s the only event where you can experience 56 straight hours of baseball with Baseball ‘Round the Clock. Experience the wild beauty and uniqueness of North America&apos;s heartland through your visit to the Great Plains Nature Center’s Art on the Trail on Sept. 24. The event allows you to interact with working artists from the Wichita area. They will demonstrate their art form using a variety of media—watercolors, pastels and acrylics to name a few—along a half-mile loop of paved trail. All throughout the summer and fall, take a step back into the 1870’s with Old Cowtown Museum’s Vintage Baseball. Autumn & Art at Bradley Fair is an alfresco fine arts show featuring 100 artists from 21 states, set lakeside at beautiful Bradley Fair on Sept. 16. In addition to the juried art exhibit and sale, this annual event features art demonstrations, performing musicians and a host of hands-on experiences for children. Wichita is a food festival paradise. This fall, visitors can enjoy Wingapalooza on Aug. 20, neighboring Derby’s BBQ Festival on Sept. 10 and the Wagonmaster’s Downtown Chili Cookoff on Sept. 24. His majesty the king has summoned the very best artisans, crafters and merchants of the realm to display their talents and wares at the Great Plains Renaissance Festival on Sept. 24. Walk the streets of our medieval fairground and sample the finest goods from all corners of the known world. International opera season includes four fully-staged operas with stars from around the globe. Opera education programs for adults, children and students also offered. Verdi’s Rigoletto is Sept. 3 and Puccini’s La Boheme is Oct. 1 at the Wichita Grand Opera. Choose from Wichita’s more than 8,000 hotel rooms, including historic hotels like Drury Plaza Hotel Broadview or Hotel at Old Town. Or indulge in the contemporary Ambassador Hotel. Plus, a 110-room Hampton Inn with a 550-square-foot meeting room will open this summer near the Wichita Dwight D. Eisenhower National Airport.